WASHINGTON — NASA’s Project Constellationprogram has been overhauled to include a slightly smaller Crew Exploration Vehicle(CEV) and a new human-rated booster with an Apollo-era upper stage engine. ProjectConstellation is the name NASA has given for the effortto develop hardware necessary to replace the space shuttle and return astronautsto the Moon late next decade. NASA stillintends to make use of the solid-rocket booster technologythat has helped lift the space shuttle off the pad for a quarter century. 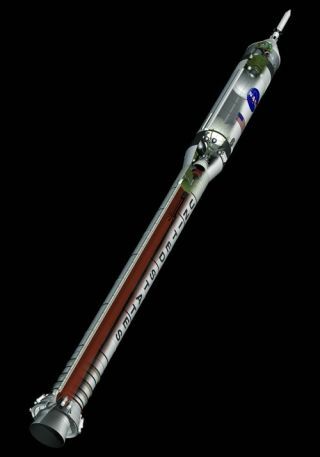 Butthe agency recently approved CEV launcher plans calling for development of anew five-segment solid-rocket booster instead of the four-segment motorcurrently in production. NASA alsohas dropped plans to power the so-called Crew Launch Vehicle’s upperstage with a Space Shuttle Main Engine modified to start in flight, optinginstead to go with an updated version of the J-2 engine that was used onNASA’s Saturn 5rocket. ProjectConstellation Manager Jeffrey Hanley briefed engineers at Marshall Space FlightCenter in Huntsville, Ala., on these and other changes Wednesday, according toindividuals who spoke on the condition of anonymity because the changes had notyet been officially announced. Thesechanges follow NASA’s decision, announced just last week, to drop therequirement for a liquid oxygen/methane engine on the CEVservice module and lunar lander, leaving it up to the two competing CEVcontractor teams — led by Lockheed Martin and Northrop Grumman — topropose whatever propulsion system they deem best. Other newlyapproved changes to the CEV, according to sources familiar with the details,include reducing the diameter of the vehicle from 18 feet (5.5 meters) to 16.4feet (5 meters) for additional weight savings and using existing Russiandocking hardware for missions to the International Space Station (ISS).Previous plans called for using a U.S.-developed system. Thesesources said NASA’s overhauled space transportation plan probably willnot save money in the near term, but should prove cheaper in the long runbecause both the J-2 engine and five-segment solid-rocket booster are neededfor the heavy-lift cargo vehicle NASA is developing for the lunar sorties itstill hopes to begin as soon as 2018. By going with the J-2/five-segmentbooster combination for the initial CEV flights, NASA can skip development ofan air-lit Space Shuttle Main Engine and put its resources toward producing anexpendable version of that engine, which NASA still plans to use for theheavy-lift rocket’s mainstage.